'Scope of Practice' laws are an ongoing swindle that drive up medical costs by artificially restricting the number of providers. Think Uber and the cab companies, but applied to health care. Naturally, the anti-competition Texas "Medical" Association is a big fan. We discussed TMA's latest lawsuit against the Chiropractors last year and again last week. 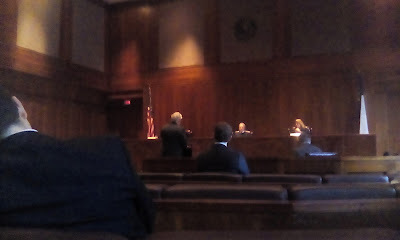 Oral arguments were held this afternoon in the Third Court of Appeals. Obviously, we attended. The arguments contain highly technical medical and legal issues. In other words, there was a lot of complicated doctor and lawyer talk. But, even so, TMA's case is transparently asinine. TMA played semantic games to argue that the chiropractors are "practicing neurology." TMA essentially claimed that, because the human spine contains nerves, working with the spine qualifies as "practicing neurology." It was dumb. The chiropractors responded by pointing out the obvious difference between spinal treatments and neurological treatments. This was followed by a technical discussion about the language of the statute. While the statute in question is waaay too narrow, the chiropractors are easily within its bounds. To be honest, this lawsuit is a reflection of the fact that we have too much central planning in health care. We're trying to 'solve' alleged 'problems' through statutes and regulations that should be left to consumers and providers in a decentralized marketplace. Free Market economics 101. Bottom Line: Our primary objection to the Texas "Medical" Association will always be their rabid support for abortion, euthanasia in hospitals, and Obamacare. But they do a lot of other bad things. This assault on choice and consumer freedom cannot stand.